The Contacts information is one of the most important parts of iPhone data. To a mobile phone user, losing contacts means your connection with the outside world has been cut off. I believe this would drive most people crazy once being caught by this kind of thing. However, this is a situation we frequently meet with. It’s easy to lose contacts when changing iPhones, syncing with iTunes, or deleting iCloud data. When you change your old iPhone to latest iPhone 6 or iPhone 6 Plus, you may choose iTunes or iCloud to move your iPhone data to a new iPhone. But your contacts information are easy to be lost or deleted. To avoid this security problem, it is important to find a safe way to recover deleted contacts on iPhone 6/6 Plus. UFUSoft FoneLab (Mac Version: Mac Fonelab), also well-known as wonderful iPhone 6/6 Plus contacts recovery software, provides you a perfect solution to recovering deleted and lost contacts when changing iPhones or deleting iCloud information. It can assist you to recover contacts on iPhone 6/5/4S/5s/5c/4/3GS. This iPhone Contacts Recovery software provides you three ways to recover deleted contacts on iPhone 6/6 Plus. How to restore deleted/lost contacts from iPhone 6/6 Plus directly? 1. Download iPhone 6/6 Plus Contacts Recovery Software and install it on your computer. 2. 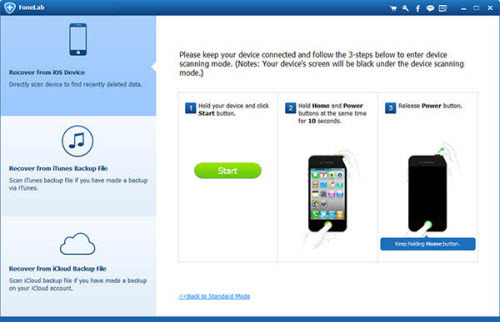 Connect your iOS device to the computer and enter the scanning mode. For iOS 7 users, you need to operate as you are told on the interface to scan your data. 3. After scanning, all the files in your device will show up. Find the contacts you want to recover by checking Contacts in the left side bar. To make sure you have selected the right file, double click the thumbnail to enlarge it. 4. Click “…” button to select a file folder to save the recovered file. Click Recover to start the iPhone 6/6 Plus contacts recovery immediately. Check “Only display deleted item” and only the deleted or lost file will be shown to you. This helps you quickly find the lost contacts. 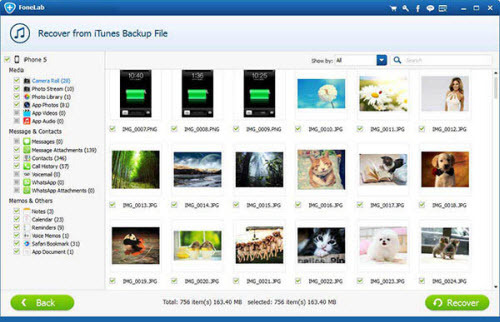 How to recover deleted/Lost iPhone 6/6 Plus contacts from iTunes Backup? 4. Click the “…” button and select the destination where you want to save the recovered file. Click Recover button to start the iPhone 6/6 Plus contacts recovery. 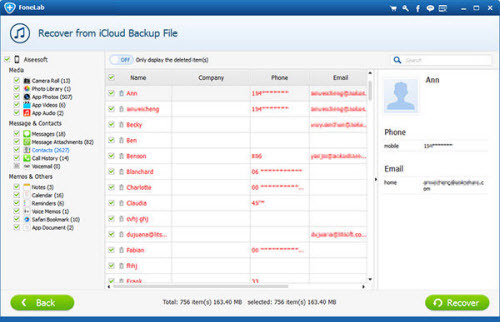 How to restore deleted/Lost iPhone 6/6 Plus contacts from iCloud Backup? 5. After the scan, you can preview all data found on your device in the scan result. The category and number of files will be listed in the left sidebar and the specific content will be displayed on the right panel. Now you have recovered the deleted contacts to your computer, you can view them on your computer and if you would change an iPhone 6/6 Plus, you can use iPhone Contacts Transfer to transfer iPhone contacts to the new iPhone 6/6 Plus.